Class 4 listened to Lee Paul Band's 'Red, White and Blue' album for the first time today to help them with an art project they working on based on the songs. After listening, Aaron said he thought "the instruments were really good", he "liked the sad songs and the happy songs" and the music had made him and his friends "smile", just like the title of one of the songs! They are all looking forward to hearing the Band play live on Drydenbury Day! On Thursday 27th March everyone in school started work towards our Drydenbury Festival. Everyone in school has lots of work to do to make the day happen! All the classes and groups in school have written BBC School Reports about the plans we have for our Festival and our School Council had a meeting to talk about which charities we would be supporting on Drydenbury Day. 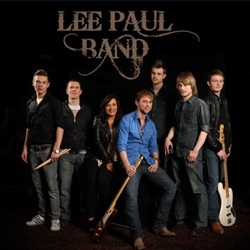 North East based country-rock band, Lee Paul Band, have agreed to headline our Drydenbury Festival. On Friday 28th February, our BBC School Reporters came together to talk about the rules of how everyone in school can be safe on BBC School Report Day when their news goes on the internet. They used a camera to film videos and take photographs of the rules they had made. They were pleased with their work, their videos which will be shared in a special assembly and their photos which can be found on this page of this website: http://drydenschool.weebly.com/keeping-safe-and-legal.html. Amelia said it was 'fantastic!' Chloe thought it was ‘fabulous’ and MJ said it is ‘important we remember these rules’. Amelia, Katie, Chloe, MJ, Jack and Mr Aaron. Dryden School is going to host it's very own Glastonbury-like festival on Thursday 26th June 2014 Initial plans are being put in place in preparation by staff for the launch of the project on BBC School Report Day, Thursday 27th March 2014, then students . . . it's over to you!